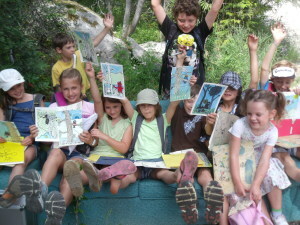 I’ve taught summer art classes in my hometown of Nelson BC for many years. I’ll share some tips for launching your own summer art camp. By the way, if you live in Nelson BC and are interested in summer art camps for your kids, email me at info4artabet@gmail.com. This is what teaching a ‘Summer Art Camp’ is all about ! A special thanks to all the Artabet ‘Summer Art Camp’ students and their parents and grandparents for making this year the best in Artabet history! Watch the film ( about 20 min ) and watch all 45 students … drawing, painting, exploring, and having fun! Learn How you can Run a Successful Summer Art Camp after you see how much fun it can be as you watch the film. For those of you who participated please pass on the experience to family and friends and we will see you all next Summer. Best to watch the film with popcorn and a wide screen. Drop me an email and let me know if you are motivated to earn income teaching Art to kids. We will be getting all the info ready for a start-up group for this Summer. A complete ‘ Artabet Summer Starter Pac” for How to Teach a Summer Art Camp will made available and you can be part of this pilot project. Participants will receive their Summer Art Camp Starter Pac …. FREE!! You must email me at info4artabet@gmail.com to get going as a participant in this Pilot Project. One more time – you must email me at info4artabet@gmail.com so I can get started with showing you how to set up your classes and earn some money teaching a Summer Art Camp. Hope to see you hard at work this Summer with your own Summer Art camp! Art Outdoors is always welcome. email me at info4artabet@gmail.com and we can get started with your pilot art class. I did not hear back from you and thought I would send you one more invitation to contact me at info4artabet@gmail.com for help getting started with your Summer Art Class. Any help you need is available on the website. Study the lessons and then do them with your students. If you need some help setting up your class then email me at info4artabet@gmail.com I would be happy to get you started with a teaching format and plan. Do or Do not … It’s up to you. How to Teach Children Art in India. It tells the story of one of our new Artabet teachers. I am Arika. I am highly inspired and motivated by your techniques of teaching art to small children. I myself want to start an art school for kids. Please help me to get my set up. Hi Arika,glad to hear about your interest in setting up an art school for kids. Here are three steps to get started. If you complete these three steps we will continue with the next three. Let me know when you have completed them. 1- Download the free Teacher’s Pac from the website. 2- Purchase and download the Artabet First Steps In Drawing Book from the website. This will be your Teaching Guidebook. 3 Watch all the videos and read all the blogs as these will give you the Artabet teaching method. Email me at info4artabet@gmail.com when you have done all this and we will then get you started with your Artabet Art School.